Baton Rouge, La – The SU Ag Center in collaboration with the LSU AgCenter will hold a Save Rural America field day in St. Helena Parish on Monday, June 10, from 8:30 am – 3:30 pm. Extension agents, specialists and state experts will provide educational programs at the St. Helena Parish Park, 227 Park Loop Road, Greensburg, LA 70441. Activities will include tours to Southeast Research Station in Franklin, Goat Farm/Johnson Rodeo Pen in Montpelier, and J&L Farms Home Garden. The event will also feature nutrition demonstration and USDA exhibit. The event is free to everyone who is interested in learning about agriculture, gardening, irrigation, wild life and livestock management. Lunch will be provided. To register, please contact Angela Myles, Parish Chair Youth Development or Rev. John Holiday, Extension Aide at 225-222-4136 or Warner Hall at 225-931-0534. 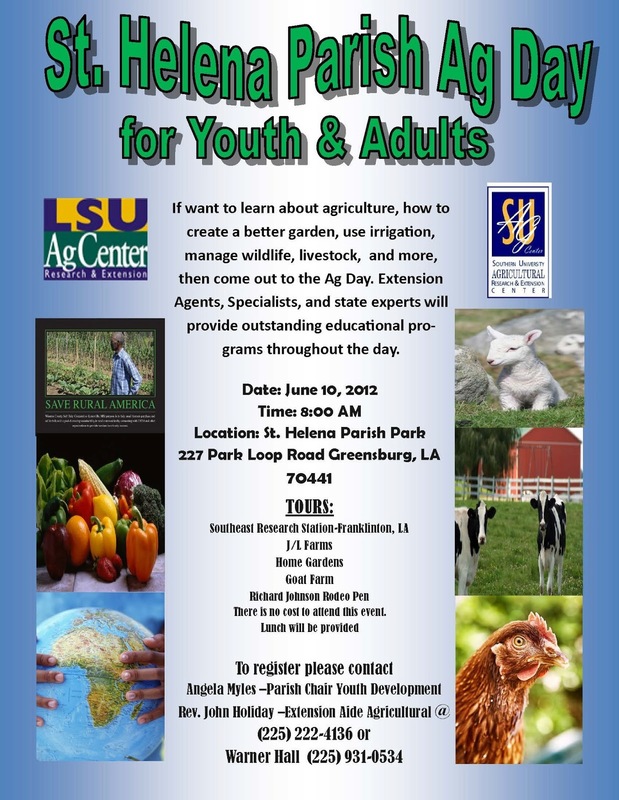 Baton Rouge, La – The SU Ag Center in collaboration with the LSU AgCenter will hold a Save Rural America field day in St. Helena Parish on June 10, from 8:30 am – 3:30 pm. 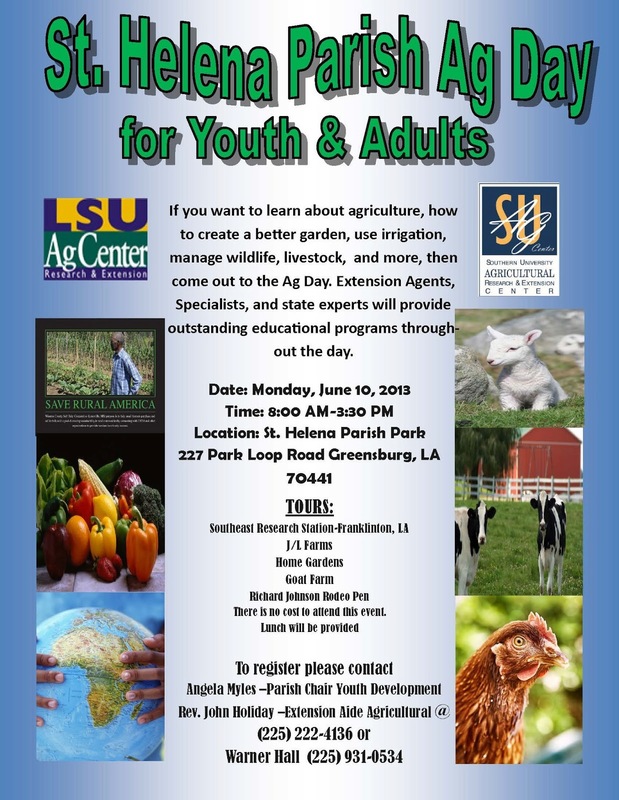 Extension agents, specialists and state experts will provide educational programs at the St. Helena Parish Park, 227 Park Loop Road, Greensburg, LA 70441. Activities will include tours to Southeast Research Station in Franklin, Goat Farm/Johnson Rodeo Pen in Montpelier, and J&L Farms Home Garden. The event will also feature nutrition demonstration and USDA exhibit. The event is free to everyone who is interested in learning about agriculture, gardening, irrigation, wild life and livestock management. Lunch will be provided. To register, please contact Angela Myles, Parish Chair Youth Development or Rev. John Holiday, Extension Aide at 225-222-4136; or Warner Hall at 225-931-0534. Baton Rouge, La – The Southern University Ag Center welcomed 20 students to the 3rd “Academy for Academic Enhancement of High School Students in the Food and Agricultural Sciences” program. Chancellor Leodrey Williams, and Gina E. Eubanks, vice chancellor for Extension were among the administrators, faculty and staff of the Ag Center who brought greetings to the students and their families. The five-week program, which kicked off May 26, 2013, recruits students in 11th grade based on strict criteria to benefit from skill enriching activities ranging from classroom instruction to outdoor tours. 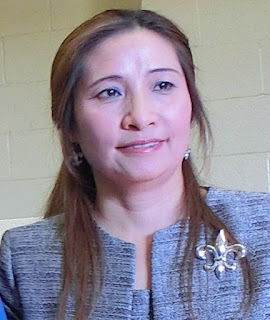 Candidates were selected from East Baton Rouge and surrounding parishes. 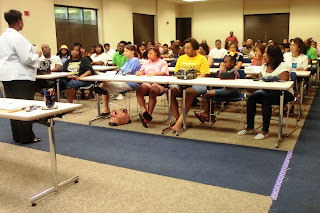 The goal of this all-expense paid residential program is to prepare youth for college or agriculture related careers. Participants, who will live on Southern University campus will hone their skills on American College Test (ACT) taking, engage in other activities such as field trips, receive community service certificate and $500 at the end of the program. The “Academy for Academic Enhancement of High School Students in the Food and Agricultural Sciences” is a US Department of Ag/National Institute of Food and Agriculture (NIFA) funded project directed by Zanetta Augustine and Dawn Mellion-Patin. “This program has been successful in increasing ACT scores as high as six points, qualifying students for TOPS and enrollment at Southern,” Mellion-Patin said. Taylor Opportunity Program for Students (TOPS) is a Louisiana scholarship program. For further detail, contact Zanetta Augustine at 225-771-2591. 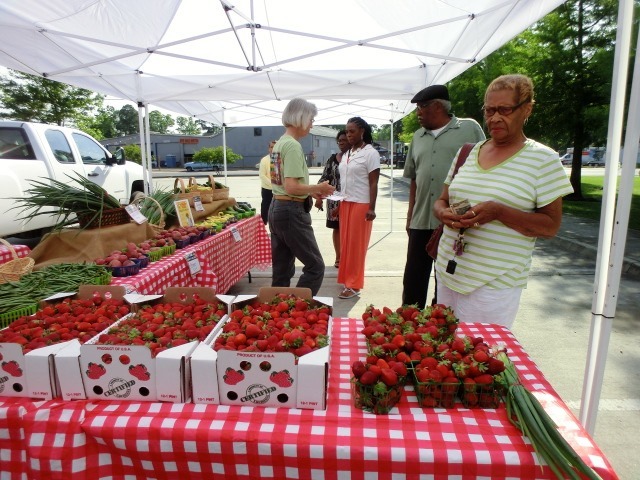 Baton Rouge, La – The Red Stick Farmers’ Market under the auspices of the Big River Economic and Agricultural Development Alliance (BREADA), officially launched its mobile market unit at the Scotlandville Branch Library on Scenic Hwy, May 15, 2013. Henceforth, the market will open every Wednesday, 9:00 am-11:00 am. The Blue Cross Foundation is building a healthier Louisiana by sponsoring the mobile fresh produce unit. The Fresh Beginnings Program, developed through Mayor-President Melvin L. “Kip” Holden’s Healthy City Initiative, has been awarded a $1 million grant by the Blue Cross and Blue Shield of Louisiana Foundation’s Challenge for a Healthier Louisiana Grant Program. The purpose of the funding is to support innovative partnerships that promote healthy eating and active lifestyles which are aimed at reducing the rate of obesity in Louisiana, especially among children. Funds have enabled the new Mobile Market to Start Rolling in May 2013. BREADA received a sub award for the Mobile Market Unit from the Mayor's Office. The goal of this collaborative effort is to encourage healthy eating and active lifestyles of the “Food Desert” communities in the Baton Rouge area. 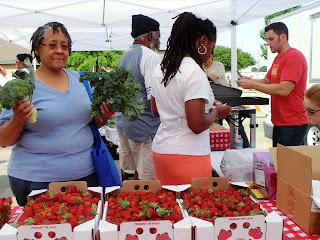 The Red Stick Farmers’ Market totes the slogan “Buy Local, Buy Fresh” on signs and t-shirts to transform producers and consumers toward a more robust economy and lifestyle in Louisiana. Present at the launching were Copper Alvarez, Executive Director, BREADA with staff members; Lydia Marin, Foundation Initiative Manager, Blue Cross & Blue Shield of LA Foundation; Sunanna Chand, Coordinator, Mayor’s Healthy City Initiative, Office of Mayor President Melvin “Kip” Holden; several Southern University Ag Center employees and community shoppers. “Southern Ag Center has been in the conversation from the beginning when we were planning strategies to solve the USDA food desert declaration of North Baton Rouge,” Alvarez said. 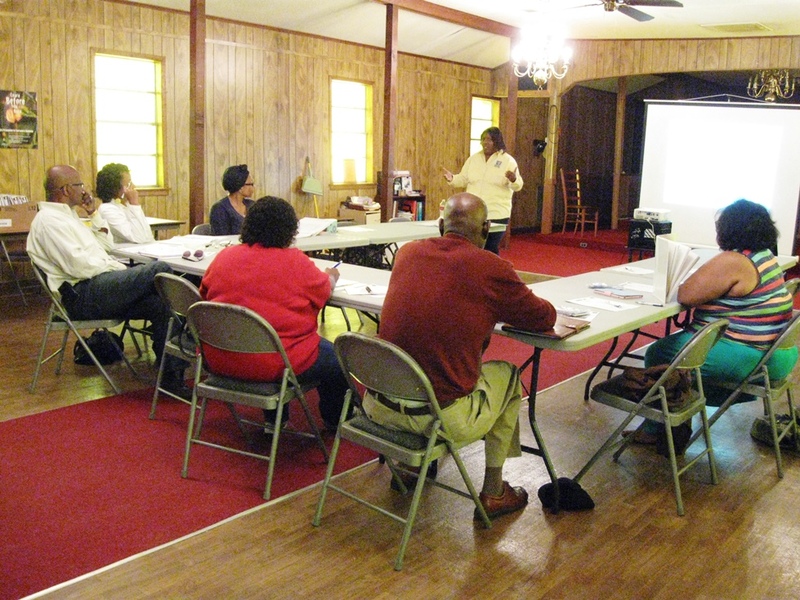 Baton Rouge, La – The SU Ag Center has launched a series of classes for Faith-Based Leaders in New Roads, Pointe Coupee Parish. Dana Isaac, grant assistant for Building Opportunities through Leadership Development (BOLD), launched the initial “BOLD For Faith-Based Leaders Class” on Saturday, May 4, 2013 in New Roads, attracting 13 participants. The program’s main goal is to enhance and strengthen faith-based leaders and make them better equipped to serve their institutions and their communities. The classes will be held every Saturday, 10:00 a.m.-12:00 noon, for 6 weeks at the Pointe Coupee Community Resource Center, New Roads, LA, from May 4 - June 15. BOLD is a statewide grassroots leadership development project under the direction of Dr. Kenyetta Nelson-Smith, assistant specialist for community and economic development. BOLD for Faith-Based Leaders is an extension of the BOLD project, focused solely on faith-based institutions, which will empower persons in leadership positions to become more effective in their roles. BATON ROUGE, LA — The Center for Rural and Small Business Development at Southern University Agricultural Research and Extension Center will hold a free business development seminar on “How to Start or Expand a Business,” from 5 p.m. to 7 p.m. on Thursday, May 21 at Brown’s Chapel Missionary Baptist Church, 70427 Martin Luther King Jr. Highway 1050 (formerly Cole Street), in Tangipahoa, La. The seminar is free and open to all current and potential small business owners. Participants will learn how to start or expand an existing business, receive the forms and applications needed to legally operate a business in the state of Louisiana, and information to ensure that an existing business continues to operate efficiently. To register for the seminar or for additional information about the Center for Rural and Small Business Development or its E-Learning Center, contact LaKeeshia Giddens at lakeeshia_giddens@suagcenter.com or via phone at 225.771.2160 or Eual Hall at eual_hall@suagcenter.com or via phone at 225.771.4105. 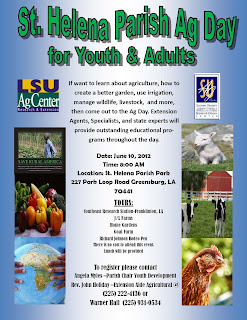 Baton Rouge, La – On May 6, 2013, the U.S. Department of Agriculture urged farmers and ranchers not to miss this opportunity to be counted and help determine the future of farming in America. The window to respond to the 2012 Census of Agriculture officially closes on May 31. The USDA has already received more than 2 million completed Census forms. The Census of Agriculture, conducted only once every five years, is the only source of consistent and comprehensive agricultural data for every state and county in the nation. The information is used by agribusinesses, town planners, local governments, and policy makers, as well as farmers, ranchers, growers and others to shape farm programs, boost rural services and grow the future of farming. The 2012 Census will provide a complete picture of agriculture that will be used to shape the future of agriculture, rural America, and the lives of those USDA serves for years to come. The deadline to respond to the Census of Agriculture is only a few weeks away on May 31. USDA's National Agricultural Statistics Service (NASS) may contact producers by phone or in person to collect Census information since time is running out. Farmers and ranchers can also return their forms by mail or online by visiting a secure website, www.agcensus.usda.gov. For more information about the Census, including helpful tips on completing your Census form, visit www.agcensus.usda.gov or call 1-888-4AG-STAT (1-888-424-7828). The Census of Agriculture is your voice, your future, your responsibility. Baton Rouge, La – Southern University Agricultural Research and Extension Center scientist’s study on live oak galls caused by a species named Arnoldiola atra has been included in the Global Species Database. The article links back to the Ag Center website by clicking on the blue tree thumbnail next to the species name. This means the research work done by the scientists at Southern University and Ag Center has created significant impact on the global community. Dr. Yadong Qi, professor of Urban Forestry and project director, commented on the publication: “We are very happy to see this happening. Also, hats off to the Ag Center webmaster and communication staff for a job well done.” Congratulations to Dr. Qi! 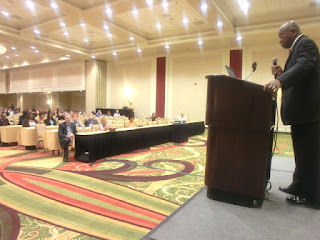 New Orleans, La - Southern University and Louisiana State University Agricultural Centers are jointly hosting the 2013 National Extension and Research Administrative Officer’s Conference (NERAOC) in New Orleans, Louisiana. The conference started on Sunday and continues through Wednesday, May 8. More than 500 officials from land-grant institutions, experiment stations and the National institute of Food and Agriculture (NIFA) are registered for the conference. This year’s conference with the theme, “Partners in the Journey” is critical and is slated to assist participants in best practices of collaborating to reduce costs. In his welcome address on Monday, May 6, Deputy Director for Food and Community Resources Dr. Ralph Otto, commended participants for work they are doing and also spoke about the FY 2013 Federal Budgets. Chancellor Bill Richardson, LSU Ag Center and Chancellor Leodrey Williams, SU Ag Center also addressed the participants and discussed the current budget situation in the State of Louisiana. Both chancellors urged attendees to take some time to tour the rich cultural and historical heritage in New Orleans and the surrounding areas and to help boost Louisiana economy by spending some money while they are here in the state. In her address on behalf of the Louisiana Commissioner for Agriculture & Forestry, the Associate Commissioner for Public Policy and Governmental Affairs, Dr. Carrie Castille, spoke about the significant role of New Orleans ports in US agricultural exports. Dr. Calvin Mackie, author, mentor and motivational speaker in his keynote speech, urged the attendees to continue providing hope to all including the hopeless, underserved, socio-economically disadvantaged youth and families, despite budget uncertainties.